"The living newspaper" is based on the theatre of spontaneity by Jacob Levy Moreno. In the early 20s' Vienna, Jacob Levy Moreno founded a theatre group creating plays together with the audience, using no scripts at all, just developing the drama on the spot and elaborating social themes suggested by the audience. It was the beginning of the theatre of spontaneity, the laboratory where Moreno experimented with his ideas that later gave rise to his most famous creation: psychodrama. The Living Newspaper is the prototype of the theatre of spontaneity. The actors, with the help of the audience, gave reality to news and social themes the audience was interested in discussing and debating. The news of the day will be played in a series of scenes by volunteers from the "audience". 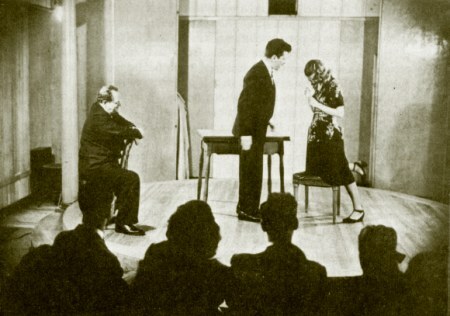 Moreno's theatre of spontaneity is at the root of all the present forms of role-playing: even the term "role-playing" was forged by Moreno to give a shared name to the new media forms he created, among which the theatre of spontaneity and psychodrama. But the theatre ofspontaneity is especially similar to present-day "theatre-style role-playing": and taking part to this event you'll be able to verify the many similarities between the very first format elaborated by Moreno in 1921 and some contemporary forms of role-playing, such as "jeepform" and the Italian "scene-based larp". “All mythology speaks of another plane that exists alongside our own world, and that in some sense supports it. Everything that happens in this world, everything that we can hear and see here below has its counterpart in the divine realm, which is richer, stronger and more enduring than our own. And every earthly reality is only a pale shadow of its archetype, the original pattern, of which it is simply an imperfect copy. It is only by participating in this divine life that mortal, fragile human beings fulfill their potential. Sort Sol is a collaborative story of myth. It invites its players to a sacred venue to explore the boundaries between the mythical world and their own. As a participant, you will engage in two battles: One fighting for your own survival and the other to avoid being forgotten. Sort Sol is a blackbox game that uses myth, masks, lighting and sound to give the players a strong experience. 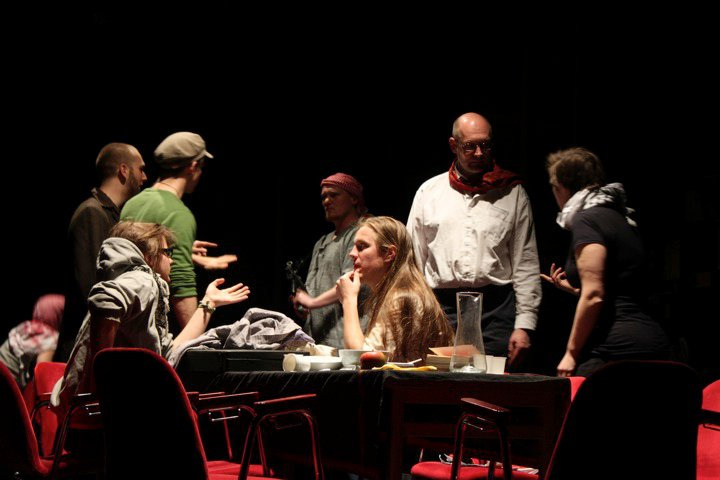 The Bader Meinhof Experiment is an interactive drama about the extreme left of activists in the 1970s, the officers that monitor them, and the terrorists who try to recruit them. One group of participants plays the police, the surveillance department and the paramilitary. The other group plays activists, communists and anarchists. We are in a space in a collective of Stockholm. The year is 1975. Abba has won the European Song Contest last year. The 1st of May is drawing to a close. What will be the main slogan? Will the Israelis come to Stockholm during the Grand Prix Final? A group of peace activists and KPml(R) have a visit from a group of fresh new members of the RAF (Red Army Faction). Andreas Baader, Ulrike Meinhof and two others are in prison in West Germany. The RAF plans to do a political action in targeting the embassy in Stockholm. The police do not intend to let this fraction ever reach their goal. But who is a terrorist, who is not? When is it terrorism? The larp Joakim is about a group of people who meet once a year. 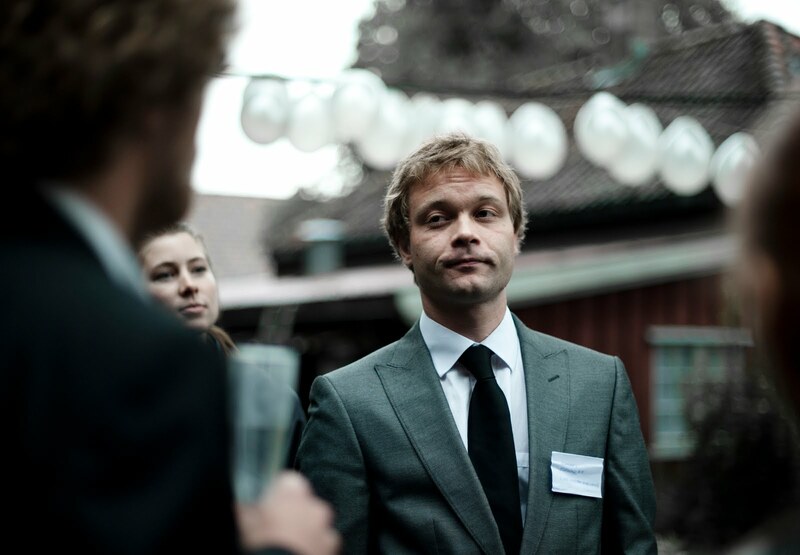 They studied theatre at Oslo Kunsthögskole and graduated in 2006, but still keep in contact. They are a thight knitted group with a lot of jargon, in-jokes and friendly bullying among themselves. The annual meet-up is a kind of vacation for some of them, an opportunity to relax and have a laugh with old friends - while for some the occasion brings a churning ache to the stomach, provocing nervous laughter which is pitched just a little to high. Some smile all night, while crying in the taxi home. This story is about Joakim, the clown. The punching bag. The really annoying member of the group. The one everybody loves to hate. Last year the group did something the don't want to talk about. Something unforgivable, and they did it to Joakim. The larp focuses on groups, and how people behave in them. Sometimes, belonging to a group forces us to become a person we don't want to be. If we refuse to address the issue and call it "fun," we can get away with all kinds of horrible behaviour. Joakim isn't a larp about intrinsically evil people. In fact, most of them would never see themselves as bullies. And some one has to be the target. It’s just how it is. But this year, Joakim isn't coming. A group of pioneers once set out for the mountains with the aim of creating a new society, bringing only the absolute necessities, as well as their hope and dreams. While having the best intentions, the pioneers couldn’t succeed. Life in the mountains turned out to be hard and demanding. They had travelled to far, and couldn’t find their way back. One by one, the show embraced them, giving them silence, peace and rest. Tranquility and light. 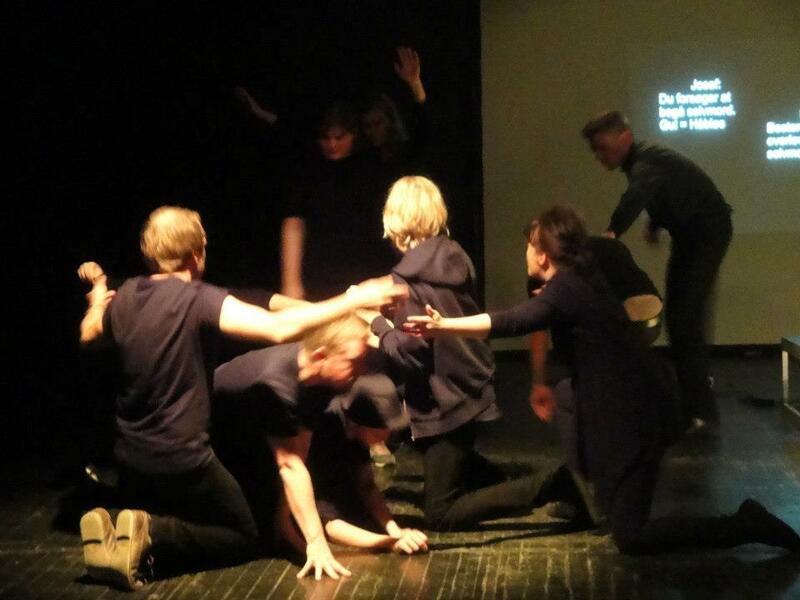 Based on the dystopian sci-fi movie Metropolis from 1927, this theatre-style larp takes the players through a series of scenes describing the story of the collapse of the “Heart Machine”. This larp is a remake of the freeform game Metropolis by Evan Torner, released at Fastaval 2012. We’re in a world where suppressed workers dwell and labour beneath the surface of the earth, while the wealthy upper class lives in decadence in tall buildings reaching up in the sky. The saint-like Maria encourages the workers to use peaceful methods to improve their situation, but her efforts are in vain. While each scene generally inhabits two to four characters, the remaining players make up the scenography – being it the the heart machine, the bubbling pots of a laboratory, the city view or wealthy Sunday strollers in the park. The genre is theatre-style larp where the players can decide on how the story develops, but only to a limited degree what happens. The game uses various techniques to assist the players on remembering the story, such as full transparency, pre-scene “voiceover” and information projected on a wall in the background during the play. This gives room for the players to focus more on the improvisation and less on remembering the rules of play. An excellent theatre-style larp suitable for beginner players. 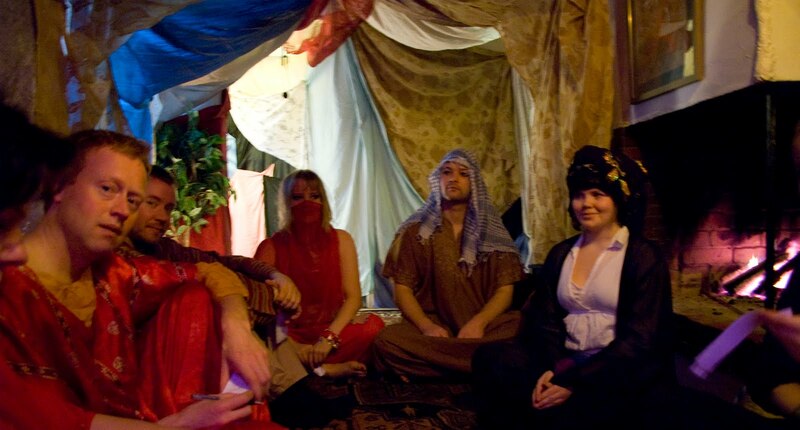 A larp inspired by “1001 nights”. We are in a tent, in an oasis in the desert, where travelers rest by drinking tea and smoking shisha, watching belly dance and haggling over camels. We’re in the middle of an Arabic desert. Not in a realistic medieval Arabic setting, but in the mythic Arabia, the way it is pictured in “1001 nights”. An Arabia where djinns are hiding in the desert or in old lamps, ready to give three, and only three, wishes to the one who summons it. Welcome to Hakim’s caravanserai, an oasis in the desert. The genre is Arabic fantasy. The focus is on the atmosphere rather than the outcome. "The summer party where passion was lost"
Welcome to the pretentious garden party of the cultural elite in Norway. The place where everyone of importance are, and those who hope to be yearns to be invited. A place for wine and canapees, distinguished conversation on the policies of the new minister for culture or the coming merge of two major publishing houses. But also a gathering of characters and their relations, their conflict and their passions. A garden party where emotion lurks right under the surface, and where few of the guests will be able to contain it. As the party progresses the guests slowly turn less emotional, less caring, less passionate. They turn into feelingless, superficial beings who no longer emotionally attach to their relations or their conflicts. They are, however, perfectly able to keep up the facade towards other people, for example through talking about interior design. Fade to Grey is a larp inspired by the movie Den Brysomme Mannen, where the main character suddenly finds himself in a world where everything is perfect. The larp is an experiment in reversing the traditional drama curve of larps. It centers on exploring what happens to the relations and conflicts between characters who are at first caring, emotional people, but eventually turns into superficial individuals unable to emotionally attach to what's happening. The larp is not about finding the reason why everyone turns grey - there isn't one. The loss of passion and turning into grey people is inevitable to all the characters at the larp. This larp is a redesigned version of the larp that was run in Laivfabrikken Oslo in July 2011, and will be published as a manuscript after the Grenselandet run. You're input and comments will be appreciated. The Kick Inside and The Dreaming are two parallell larps about four friends: Agnes, Marcus, Olivia and Thomas. Each of the two games follow the persons through three stages in their lives. Major themes are identity, choice and acceptance and how we cope with changes. The Kick Inside is a game about parenthood and finding meaning and identity in the different stages in life. The Dreaming is a game about how we are formed by our parents and how our upbringing resonates through our lives. Both games share the same dramaturgical structure. Everything takes place in a cabin in the woods. 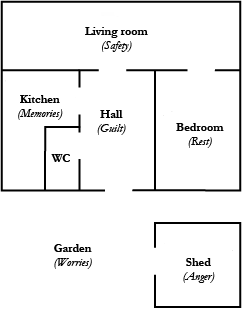 The outline of the cabin is marked on the floor with tape. The game is broken down into four acts. Each act handles the concept of parallell time differently. 10 personalities, 5 patients, 2 realities, 1 psychosis. Welcome to Happy Stay Asylum. This carousel plays our song. Mine. And the other me's. For a brief moment I ride a fiberglass horse of consciousness under these bright carnival lights untill I disappear to the other side of insanity. I am gone now. And it's his turn, the other me's. He rides forth, takes my body and my words and my spotlight, continues my life without me. And so we share a mutual cycle, me and me, while the carousel of madness spins and spins. 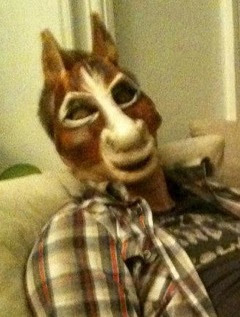 "My mad, mad Carousel" is a weird look into multiple personality disorder. It starts with five patients who have just entered their new peer group at the Happy Stay Asylum. Well, five patients, but actually ten personalities, each one spinning from consciousness to psychosis and back again. The game is played in two rooms at the same time and every now and then the personalities of a patient are swapped between the rooms - oh, but not before a little chat with a good old subconscious of a tormented mind. Instructions: English. Playing: Whatever you can speak. The year is 2012. It's late November in Oslo, Norway. Most people are outside, enjoying the spring. At 16:17 the TV and Radio broadcasts is interrupted by an extra news update. The few who are listening to radio or having their TV on are informed that Copenhagen, the Danish capital, has been hit by what appears to be a nuclear attack. At the end of the news update, there is an unconfirmed report that Paris and Washington DC is hit as well. The news starts spreading online, and among friends, but most people are still happily unaware of the event when the air alarm sounds at 16:21. Thinking of it as a test, most people ignore it. But some of those who have heard the news take the alarm seriously. At 16:27, Oslo is hit by a one megatonne nuclear bomb. Sarkofag (Sarcophagus) is about a handfull of people who managed to seek refuge in a bomb shelter room. Unfortunately, the shelter is not of the kind that can keep them safe until the world outside no longer poses an imminent threat. What they have achieved is only a postponing of their death. What happen when you realise that today it's the sunset of your own existance, perhaps the existance of mankind? Do you hold on to your most beloved ones? Do you seek comfort in the bible? Do you write poems? Or try to ease the pain with alcohol or drugs? There is no outside hope in this larp. It is about the atmosphere in the shelter room as the characters gradually realize that their time on earth is up in only hours or minutes. This larp is a remake of the game "Sarkofag". The original concept was written by Jone Aarenskiold and Kaia Aardal and run in Kristiansand in 2006. 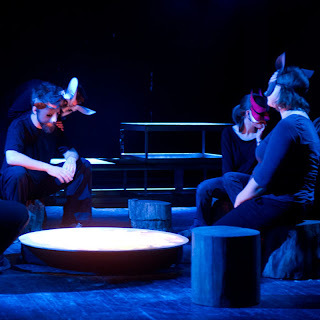 When Our Destinies Meet requires 2 hours of preparation and 2 hours of black box larping, which uses theatre techniques and shifting perspective as the player, director, narrator, and audience. 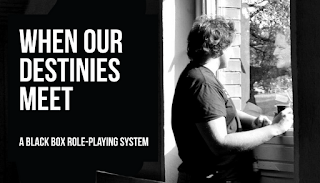 Using a model where larps are created by the participants in workshop before play, you should be ready to hash out some relationships and plots. In the version on Grenselandet 2012 you will play a story with a sci-fi theme. Besides that, the only components and preparation we have as we enter the game are as follows: a party, social roles and, one or more destined meetings. We decide these three factors together during the workshop. First, we spend approximately 2 hours to create the drama, the game, and the relationships; then, we play for approximately 2 hours with a 30 min debrief. That is the total structure of the game and its preparations. A game to go. Out of the box larping. Tired of cold autumn days? Fed up with working? Take a rest and become one of ten tourists, being on excursion in Romania. Find yourself in the atmosphere of novelty. 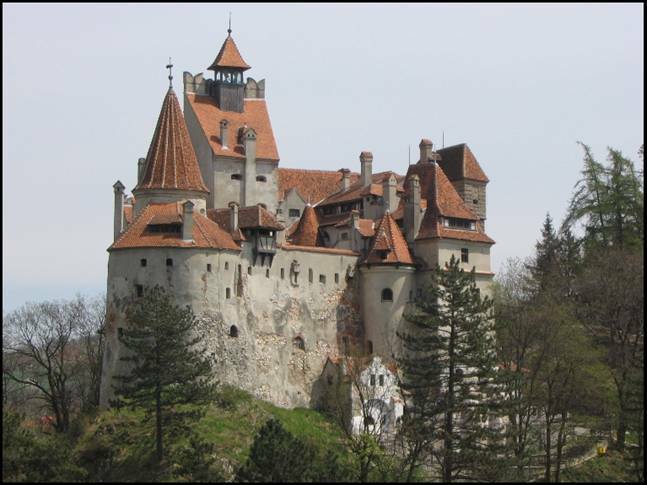 Let your imagination to visit Bran Castle – the asylum of legendary Vlad Dracula. The genre is a social interaction game. If you want to know how your ego will behave in multichoice alternative, try on a role of one of extremely stereotypic characters! The idea to bring stereotypes into the game lets to come over prejudices between representatives of different social groups. The game focuses on psychological interaction and collaboration in different situations. New Voices in Art is a chamber game about about a group of aspiring artist the night before the opening of the exhibition ‘New Voices in Art’. 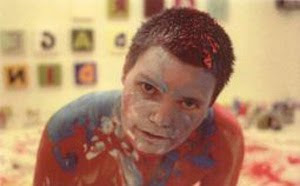 The participants play a version of themselves as aspiring artists. The main themes of this game are ambition, ambivalence and aloneness. The world of modern art is used as a setting to symbolize our yearning for success and fulfillment as creative individuals. I am the boy who lost his father. He sat by the phone, waiting for his dad to call him. He was afraid that his dad didn’t love him anymore. He thought about calling him instead. He did nothing. So nothing happened. 3 persons awakes and know, that the world is soon going to end. Nothing to do about it. They says farewell to all that they have known and begins a journey. On the way they meet others, who gives them the opportunity to recreate themselves from scratch. Take new names. The journey ends at the mountain. And the world comes to an ends. A is alone in his apartment. Looking out through the window, noticing a silhouette in the apartment across the street. The silhouette stops, and turns towards A. A crouches, almost panicky. It never turns out well when A comes into contact with other people. It is not because A doesn't want to talk, it is just hard. And it seems like they never really want to talk to A. Maybe it is because A never gets to say anything. In another time, or another world, A is walking through the darkness. It has been a long while since the Sun went down for the last time. It is cold, it is dark, and it has been a long while since A has seen other people. Next to A, The White Cat jumps from one car roof to the next. A can hear Shadow and Loneliness Itself are in the middle of a discussion. Everyone here is missing the Sun. The White Cat notices a silhouette in the horizon, and warns everybody. They all freeze and it is suddenly very quiet. Exile is a short game about loneliness. The tone is gloom and poetic, but with a hint of hope. The playstyle switches between storytelling about A alone ad confused in the city and character play in a future where the Sun went down and never came back up. Exile is your kind of game if you like a slow and strange vibe, and if you don't mind playing a cat, a concept or a shadow. Exile won the 2012 scenario competition on Forum. The jury from Forum 2012 writes the following about the game: "Eksil fra verden (Exile from the world) is a solid and well-rounded scenario which guides the players using simple warm-up exercises, well-chosen techniques and a beautiful final scene. 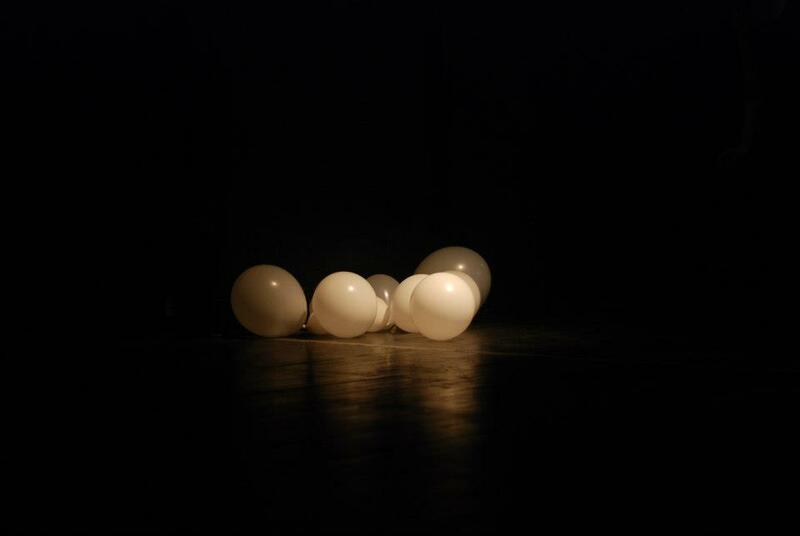 It is a touching, challenging and player-controlled narrative which deals with a complicated subject in a poetic way. It is a powerful image of solitude, when A and his strange friends share the last can of tuna in the world." Sophie is about 12 years old. Now her parents have decided to get a divorce. Sophie doesn’t know why, because Sophie’s mom and dad never really talks to her about it. Sophie has heard about parents who split up and remain friends. Or at least see eye to eye. That is not how it is with Sophie’s parents. They pretend that is how it is, but it really isn’t. And then there is the way they pull at her. A firm grip on both Sophie’s arms, each in their own direction. Sometimes Sophie thinks that they are doing it because they love her very much and want to be with her. But mainly it seems like they only try to draw her away from the other one. It’s not a lot of fun being Sophie. It is not a lot of fun being Sophie’s parents either. 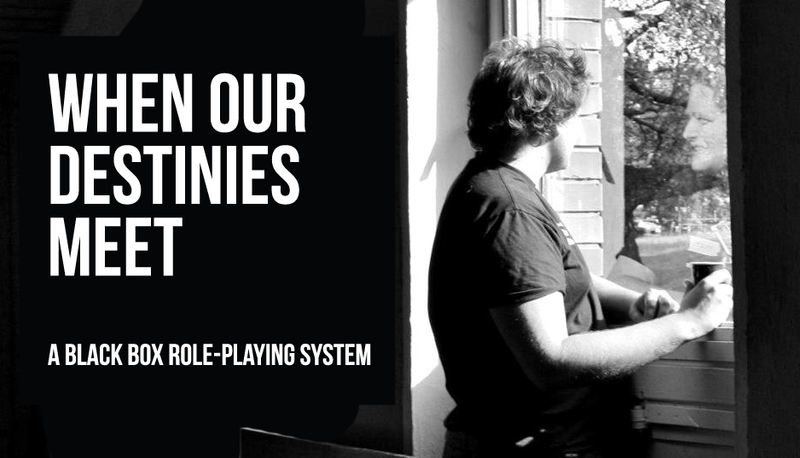 A 2 hour gamemasterless freeform scenario for three players about divorce, egoism and the struggle to keep yourself together. By Stefan Lægteskov & Kristian Bach Petersen. Runner-up of Forum 2012's scenario competition.